Herb Robert, or what was once known as Saint Robert's Herb, was named after a French monk who lived in 1000 AD, who has cured many people suffering from various diseases using this plant. First Nations people have used this plant internally to help with many health ailments and externally for healing wounds, herpes and skin eruptions. According to an article in The Healing Journal, scientists, herbalists, and botanists have discovered that Herb Robert grows especially abundant in areas that have high radiation levels (which include under hydro lines). 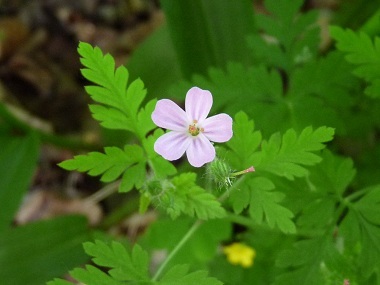 It is believed that Herb Robert absorbs the radiation from the soil, breaks it down and disperses it. Distinguishing Features: Herb Robert is a ubiquitous sprawling plant well-known for its unpleasant smell and its vibrant bright pink flowers. This plant flowers from spring all the way into October if the weather conditions are good. Flowers: Herb Robert flowers is actinomorphic (meaning it is a radial or star-shaped flower). It measures 1.5 to 2 cm (0.6–0.8”) across. Herb Robert has five petals, is usually a dark rose-red, with paler veins, and round-tipped. (Sometimes the flower is pale pink.) It has five sepals with broadly membranous margins, is glossy, long-haired, and erect. This flower has ten stamens and the pistil has five carpels. Flowers usually grow axillary in pairs or terminating stems. Herb Robert blooms anywhere from late spring into early autumn depending on location. 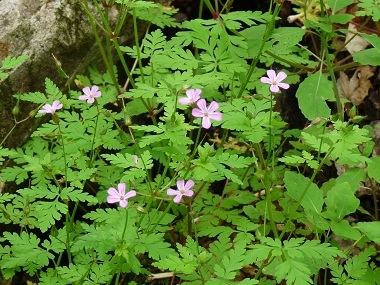 Fields of Nutrition has medicinal benefits and vitamin/mineral content of Herb Robert. Leaves: Dark green leaves are palmately divided, about 6 cm long, with light green, purple-edged leaflets. If Herb Robert leaves are picked regularly, this plant will produce a bounty of leaves so long as the growing conditions permit it. Height: Average height of this plant is between 30 and 40 cm. Habitat: Moist shady positions in undergrowth, rocks and walls, hedge banks, and waste places. It grows best in shady areas. Edible parts: Fresh leaves can be eaten or tossed into a mug to make a tea. The flower and leaves can be dried and stored so that it can be used throughout the winter months as a tea or tossed into salads as a nutrient booster. The root can be dried and used. Rubbing fresh leaves on the skin is said to repel mosquitoes, and the entire plant repels rabbits and deer.